Once the leaves start changing I’m jonesing for earthy, comforting flavors. Luckily, the farmer’s markets are spilling over with all manner of funny shaped, tantalizing mushrooms. The biggest crime in the world is throwing them into a stew, where they’ll get hopelessly lost. My favorite way to enjoy fresh mushrooms, like chanterelle, porcini or trumpet, is super simple: sauteed in olive oil with lots of garlic, a little salt and pepper, fresh thyme and a splash of white wine. Finish it off with a squeeze of lemon juice. I like to serve them with a farmer’s market plate; some roasted squash, grilled peppers and some mashed root veggies. You don’t need to employ the entire spice rack when you’re cooking with farm fresh ingredients, it’s much more important to learn the simple cooking methods that coax the most flavor out of them. I’m going to cover a few of those methods through out the month. Won’t you join me? Preheat a large, heavy bottomed pan over medium heat (cast iron is awesome.) Saute the garlic in the olive oil for about a minute. Add mushrooms, salt and pepper and cook for about 5 minutes, stirring occasionally. The moisture should release from the mushrooms and they should be tender but still firm. Add white wine and turn the heat up. Cook for about 3 more minutes, stirring often. Add the thyme and squeeze the lemon juice in. Taste for salt and serve warm. I love mushrooms ( and garlic) ..and those look amazing! YUMMY! I love mushrooms so much. Fancy ones like these should be eaten as plainly as possible and white wine really brings out the flavour of them. I used to hate mushrooms but now I’m in love with them. I had a hard time finding these in VT but here it’s a little easier and the wine is so cheap! Oh, that’s exactly how I do my mushrooms (minus the lemon juice, which I’ll have to try next time). Yum! 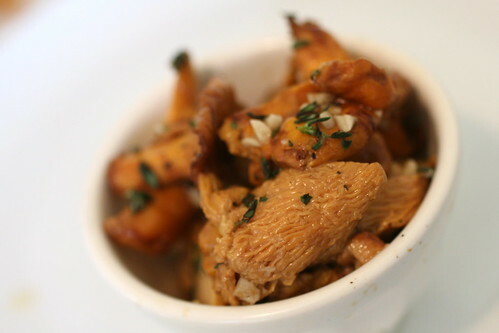 I’m constantly looking for the perfect recipe to showcase chanterelles without overpowering them! I absolutely have to try this before the season is over. Lemon juice is magic with oyster mushrooms as well. I usually only cook those on super high heat with a tiny bit of oil, salt and pepper, and lemon juice to finish. Delicious. Why have I never added white wine?! Mmmm. . . mushrooms and wine. Delicious. It must be the fall that has me all hot and bothered for mushrooms too. Thank you for sharing this. You might want to try dry sauteing some of the mushrooms. 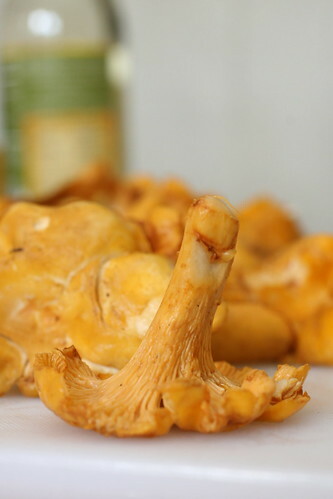 This is especially good with chanterelles since they hold so much moisture. Heat your pan on a high, add the chanterelles with a bit of salt and stir them until they release their own juices. Then cook them in their own juices for a bit before adding your oil (I usually use Earth Balance). If there’s too much mushroom juice you can drain it off. I learned this technique from my mushroom field guide and it works great. I saw some chanterelles at Whole Foods last night and marveled at their lovely color. I’ve never tried them, but now that I know a tasty way to prepare them, I think I will! Thanks Isa. Yum! I love chanterelles something fierce! We used to pick bagloads at the end of summer in Sweden with my grandparents, and I agree that the simplest preparations are the best for something so tasty. Mouth watering. I need to go find me some mushrooms. hello, anything with garlic and wine is delicious. but mushrooms are so classic with these flavor combos. so beautiful too! Thyme is my fav, though mushrooms creep me out. I’m sure they taste good, I just can’t look at their wrinkles. I love mushrooms. Their flavor is unbeatable. I never tried chanterelles though. I really want to taste these mushrooms now! Your preparation is so simple and I agree with food this fresh it’s best to keep it nice and simple! >You don’t need to employ the entire spice rack when you’re cooking with farm fresh ingredients, it’s much more important to learn the simple cooking methods that coax the most flavor out of them. I’m going to cover a few of those methods through out the month. Won’t you join me? Those look fantastic! I love mushrooms so much. oh my word! just made this with locally foraged chanterelles and a local chardonnay. Delicious!! 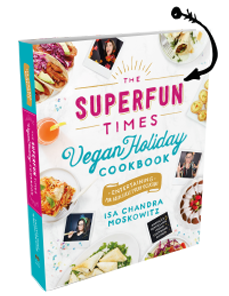 This is the best recipe to make me look like I actually know how to cook fancy mushrooms. Thanks! I only got into wild mushrooms this year and finally found my first Chantarelles yesterday (I live in Israel and they are very rare here). I collected a bit more than a pound, cleaned them, looked for a vegan recipe and tried yours. I am telling you this was delicious!!! I can’t wait to go out again tomorrow hoping to find some more, and do this again. mmm…mushrooms. I love it and look fantastic!!! I am going to wait for my son to make this nice recipe, but I do not know how long his trip is. Also I do not know if he, in this travel, is still cooking his own food, or is eating fast food all the time… jejeje. The problem is I fear spoil my mushrooms with the time pass, I going to lose my main…LOL. Showbox App is the best streaming app all the time and love to use this app so much. ou have landed at the right place wherein you can learn more about Bigo Live app. It is the best app that lets the users interact with one another all over the world. Bigo Live is the best application specially designed for the Android device platform users.